Visit the houses at Ephesus Terrace Houses ( Houses of the rich.) used from the 1st century to 7th century AD. This tour includes a visit to the Terrace Houses ( Slope Houses ), Terrace houses were inhabited by the most qualified and wealthy social class and for this reason they are also known as the rich people houses. In the excavations carried out in recent years and they displayed the daily and pompous life, the passion for the art of the rich businessmen were very simple looked from outside contrary to the temples. Contrary to the temples with with simple interior decoration despite the splendid front facades, the interior of the houses of rich people had all sorts of comfort and luxury of that era and naturally, they had been established near to the most important edifices of the city such as theatre, libary. Some of the major finds from the Terrace Houses can be see in the Ephesus Museum. After enjoying the Turkish cuisine at the village, you will returning to where your tour concludes. This is a relatively new part of Ephesus to tour – you see archeologists uncovering more treasure sites as you go from level to level. Beautiful and breathtaking is the best way to describe it! The only problem is that people with disabilities really cannot tour this as lots of steps and climbing is required. Ephesus was magnificant. The guide was on time, This was a good trip. We booked a privatetour while on a cruise. We requested a visit to the Terrace Houses and we are glad we did. It was very interesting to see how the rich lived in ancient times. Most large tour groups don't tour the houses because they are not set up for large groups. Most people walk through Ephesus and skip the Terrace Houses. They are missing the best part of the whole site. You also get to see active excavation and restoration work in process. 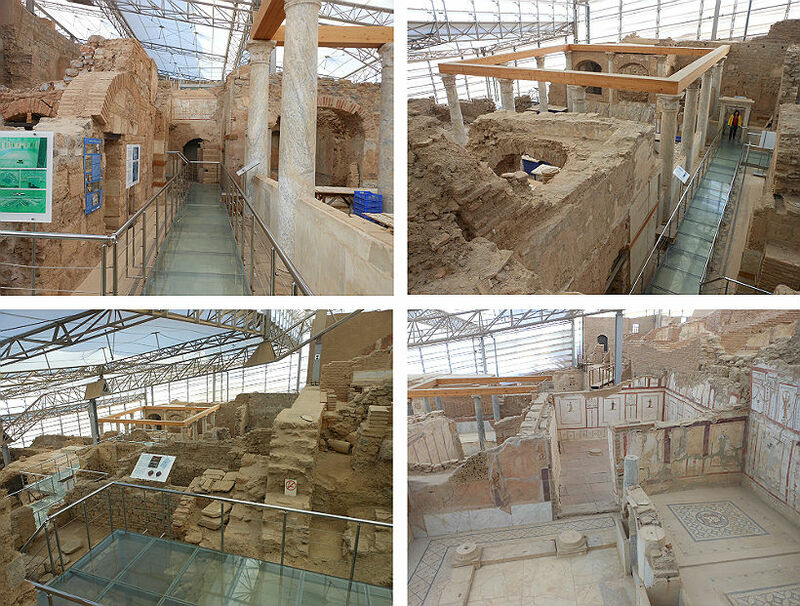 The seven houses now excavated are amazing and give a great glimpse into the life of the elite of Ephesus. The mosaics and art is amazing. The beauty, remarkable preservation, and historical significance of Ephesus cannot be overstated. The best preserved glimpsed into the lives of the Ephesian elite lies under unassuming plastic coverings on the slope of a hill… If you have made the trek to Ephesus, spare no expense to see the Terrace Houses. This part of excavations has a separate entrance and takes an extra ticket. The exposition arranged in a separate roofed pavilion and there are a lot of steps you need to pass up and down. A lot of houses and other structures are unearthed and preserved there with their unique mosaics and frescoes. This is a fantastic way to visit ephesus. It is a fantastic day even the food was excellent and our tour guide was great. Done a day trip to ephesus, it really is amazing, and steeped in history. They are still uncovering ruins to this day. It gives you a real insight into time gone by. We had no idea what we were about to see when we reached the Terrace Houses. This remarkable "dig" (excavation) has been completely roofed over while the excavation continues. The cover helps protect the 3000+ year old remains, including the tile colors. We loved seeing inside the homes of the ancient people who lived in those houses. There is a lot of preservation happening at the site. 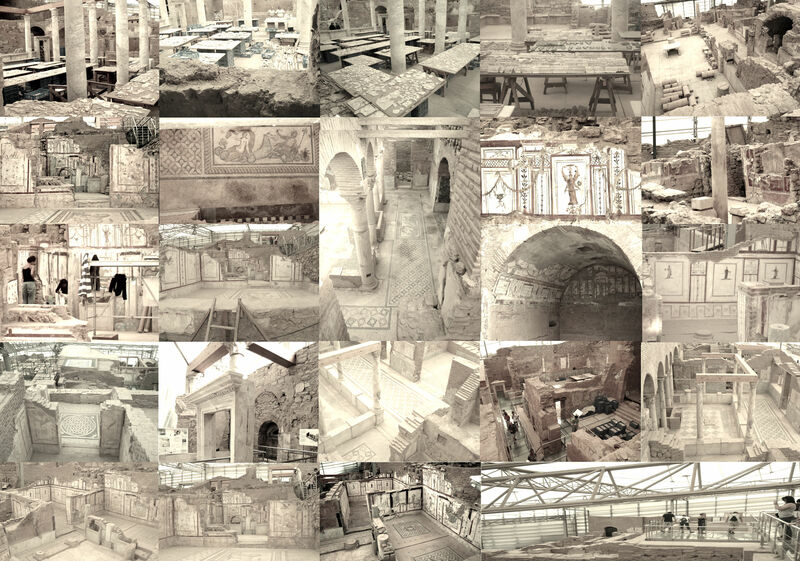 You can still see the frescos and tiles – how can that be after so many thousands of years? The ticket cost is extra from Ephesus and well worth it. Great experience. Took me back to previous trip to Pompeii. Terrace houses is a separate entrance fee and is located inside the ruins of Ephesus. Allow 1-1 1/2 hrs. Visited with a guide. A lot of going up and down steps. Place is well taken care of and has a roof. Make sure you afford yourself enough time and buy the ticket to the Terrace Houses. Covered beneath a modern structure, the terrace house excavations afford you a chance to see how the wealthy lived nearly 3000 years ago. Central heating, views and spectacular mosaics sure set them apart from the other residents. We visited the the Terrace Houses last October. It is an extra cost on top of the regular tour into Ephesus. The houses are located within the ancient town of Ephesus. We were actually past the Houses before it was brought to the attention of the tour guide that we had paid to see them. The trip was great, very well organized from the beginning to the end. The transportation very comfortable and we loved our guide, was a great experience and enabled us to see the ephesus and virgin mary house, learn about the most beautiful history in the world the history of ephesus. Thank you and we would definitely recommend this option to anyone interested in visiting ephesus. The guides were all professional, knowledgeable and personable. Love it ! Ephesus is simply beautiful. We had no trouble understanding our guide. Lunch wasn’t fantastic but everything else is good! The terrace houses are covered up by a tent like structure so from the outside they do not seem worth visiting. There is a fee so sometimes some tours do not include the visit. You will walk on plexi glass over excavated sites but although I am afraid of heights I had no problems. The preservation effort ongoing at the Terrace Houses is extraordinary! They had reassembled a large area of this feature like a giant jigsaw puzzle. It really gives one a glimpse into the past as to what houses of this time period looked and felt like. Do not miss this attraction even though it is an additional fee to tour. This is a key part to any visit to Ephesus. Sure you have to pay extra, but it's 100% worth it. Nowhere in the world can you see Roman houses like this. The mosaics are amazing! Atraves de esta pagina quiero agradeser a todas las personas que hicieron este tour posible desde el chofer guia agencia y todos fue todo muy bien organizado la verdad no encuntro alguna cosa mala han pasado casi 2 meses de que volvimos del tour con mi familia y no hay dia en que no recordemos algo de ese maravilloso momento nos acordamos de nuestro guia que era muy conocedo y profesional en el tema ademas de eso era muy divertido ya saben que un guia puede ser muy bueno pero si no es divwertido el tour no pasa… Este era genial… Despues de nuestro dia completo que pasamos en efeso y la casa de la virgen maria en turquia nos devolvimos a nuestro crusero comenzaron las bromas con mi familia diciendo: Quedemos nos a trabajar y a vivir aca en efeso 🙂 fue una maravillosa experiencia… despues de llegar a nuestro pais comense a buscar atravez de internet cocina turca aver si podia hacer lo mismo o algo similar a lo que comimos alli, es tanto lo que recordamos nuestro tour que tenemos un pequeno rincon en nuestra casa con recuerdos de efeso y la casa de la virgen maria e incluso aun tenemos los boletos de entrada a los museos 🙂 Aca en mi pais son las 01:28 AM y estoy organizando otro tour para mi y mi familia tengo planeado realizarlo a mediados de septiembre y lo mejor de todo essss que sera una sorpresa para mi familia manana la dare al desayuno 🙂 espero que ustedes tambien visiten el lugar se los recomiendo de todo corazon…. Exceeded my expectations. The guide was Emrah, and extremely knowledgeable. This wasn’t someone doing this “gig” for a short time, or until something better came along. He had done it for a number of years and it showed. Incredible tour. Best one of the trip. I couldn’t more highly recommend this tour. These are a must. Well worth the extra, a bit of a climb, but the effort is rewarded. That the original owners moved house, or redecorated is illustrated by the original frescos covered by marble. Our guide was truly a blessing! She was knowledgeable and easy to understand. I am sorry I do not remember her name, but she was so considerate to us and to the elderly woman traveling with us. The tour of Ephesus was delightful and unforgettable for us. The vehicle we used was beautiful and very comfortable. The driver was a gentleman. All in all, a wonderful tour and one I would not hesitate to take again and recommend to others. A good guide may be able to make this covered work in progress come alive. Great for archaeology buffs, but average people will just pay more money to see some square walls and a few bits of mosaic. so ancient yet so modern. the romans were indeed master builders felt we just didint have enough time. Doing a tour with only 8 people was wonderful. Ephesus is gorgeous. We were amazed with the sophistication of the multi-level ancient houses. One large room was filled with tables full of small pieces of ruins, waiting to be assembled like a jigsaw puzzle. In one room, you saw an excavated window, while an adjacent window was still sealed with debris. Many colorful frescoes and mosaics remained. In Izmir, we were picked up right at the cruise ship at the appointed time and boarded a large van for just the four of us. You can book the tour on-line ahead of time, and you can pick and choose the sights you want to see. Overall, more reasonable than the ship tours, and a lot more flexibility, this tour company is great. Our guide was prompt, polite, knowledgeable and honest, and we had a very careful chauffeur as well. We would certainly recommend the young gentleman, Selcuk Senkan, as a guide if you are in Ephesus Turkey. But we still liked it. Lots of stairs. Was nice to get out of the Turkish heat. Very different from the surrounding ruins. We arrived by cruise ship and only had one day in Kusadasi Turkey so decided to make the most of it seeing everything we could in such a short time and we decided to book a privatetour of the ruins of Ephesus that included the terrace houses. The terrace houses, currently in the process of being excavated, are covered by a structure that is out of place within the Ephesus archeological site. Excavation has been going on for at least 30 years, and it is fascinating to see pictures of what the site looked like in 1967. Fabulous. Great way to see the ephesus and house of mary and learn alot of history. Guide was very knowledgeable. Clearly the most amazing part of our tour in Turkey. Not to be missed. We were in awe of the amazing effort that is being put in to restore this historical treasure. The people in our group ranged from 17 to 63 and everyone was blown away. cuando mí esposa y yo entramos en la casa, los dos extremos de un sentimiento emocional, tan fuerte, que se conmovió hasta las lágrimas mientras que orabamos. Although some tour guide skip passed these terrace house, there a must see very well worth the cost. it's amazing how they lived and managed there life. The line was incredible the day we were there so very happy we booked the tour. Well worth the money. Lunch was quite good also. Several factors made this all day tour of Ephesus well worth the money. knowledgable guide, delicious lunch, and plenty of time to enjoy the sights. I recommend this tour. We paid extra to include the Terrace Houses. Some of the mosaics are very well preserved and they are gorgeous. Seeing these homes truly gives you a perspective of how those very wealthy people lived. They thought of every detail, including toilets and how they made their servants warm up the seat for them prior to using them. This was my third visit to Ephesus, but my first view of the Terrace Houses. There is an extra admission fee, and there are LOTS of steps inside the sight, but it is worth it. If nothing else, you get of the hot sun and the horde of crowds for a while. It is well worth the extra to tour the Terrace houses while you are in Ephesus. This site is a working site and extremely interesting. Apparently where the richer people lived. There are , I think, 188 steps to climb, but it isnt all one climb so not that hard. Small Group Day Trip to Ephesus was one of the highlights of our trip overseas. Having the small group was brilliant, as we didn’t have to wait in queues or line-ups and our driver and guide Selcuk was fantastic. He was very informative, professional and most helpful. Cuando entre por la puerta de la calle del Gimnasio ya estaba emocionado. Estaba en Efeso, una ciudad mítica, donde fue sitio de peregrinación por su templo a la Diosa Artemisa, donde se cree que huyó y murió la Virgen María (aunque los Ortodoxos dicen que murió en Jerusalem) y desde donde San Juan empezó a predicar la palabra de Cristo, vamos historia por todos los lados; el Gran Teatro es exuberante, la calle del Puerto, la Vía Marmórea, la calle de los Curetas, las casas de la Colina, la casa del Amor, la Librería de Celsius, las dos Agoras, el Odeón, la Basílica, tanto, tanto, tanto y tan bueno. El hacer algo productivo para la sensibilidad, tu corazón y la cultura no tiene precio y como ejemplo las ruinas de una ciudad mítica como es Efeso. A cinco km tienes la casa donde se cree que vivió y murió la virgen María (realmente un sitio con una energía especial), según vas hacía Selcuk tienes un camino que te lleva a la Basílica de los Siete durmientes (otro sitio mítico y milagrero cristiano, aunque se demostró después el porque de “los siete durmientes”) y aconsejo acercarse a Selcuk, un castillo cruzado domina la ciudad, está la Mezquita de Isa Bey y las cuatro piedras que fuera del impresionante templo de Artemisa, razón por la que Efeso era sitio de peregrinación, una de las siete maravillas del mundo antiguo y que ardió el día que nació Alejandro Magno, y la tumba de San Juan, y la iglesia de San Juan . Me hubiera gustado dar una vuelta por la ciudad, pero las piernas ya no estaban para mas. Desde luego una experiencia única e irrepetible. los recomiendo de todo corazon son muy buenos en lo que hacen es una linda y exitante experiencia que creo que todos tenemos que vivir y ver en la vida…. This was an excellent tour of the ephesus. Our guide Emrah was excellent and very knowledgeable. We recommend the full day trip as it gives you plenty of time to see everything and the lunch was fantastic. Thank you. We spoke to several people that didn't tour the Terrace Houses because of the additional fee. We absolutely felt that the Terrace Houses were worth the additional fee and were a highlight of our day in Ephasus. The houses and mosaics were incredibly interesting and impressive. I have been to tons of ruins all over the world and in my opinion, these are the best I have ever seen. The way these houses are built into the hill and the fact that they have uncovered so much is truly amazing. You must be able to climb steep, narrow steps to visit here. The terrace houses are amazingly well restored and preserved. The mosaics alone are worth the visit. Such an incredible find – only wish someone with more money would pay for more excavations nearby! Such a worthwhile site to visit! We thoroughly enjoyed the ephesus tour. Tour guide was knowledgable and personable. Tour was amazing and highly recommended. A great day. If you begin your tour of Ephesus early in the day, chances are, you will get to the terrace houses before the route through the exhibit becomes a train of shoulder to shoulder people. It's worth it just to see the amazing mosaics, in perfect condition and the frescoes on the walls of these ancient, wealthy homes. Touring the Terrace Houses was the the highlight of our visit to Ephesus. It was easy to imagine what life must have been like so many years ago for these wealthy Ephesians. And you can catch glimpses of what they really looked like! It was also interesting watching some of the restoration/ excavation that is ongoing. Excellent service, comfortable van and very professional guide who gave just the perfect amount of information. There were only 8 of us, so much nicer than crowding onto a large bus. I had read the reviews before going and knew not to skip the Terrace Houses, but even my highest expectations were exceeded. The reviews had prepared me for long lines and a slow pace through but for whatever reason it was almost like we had the place to ourselves. We started the day by visiting Ephesus and went into the back entrance, which was incredibly smart because it meant we were going against the crowds and that we had the wonderful amphitheater mostly to ourselves. Our price included all entrance fees, including into the Terrace Houses, which were definitely a highlight of the day and the House of Virgin Mary. Well worth seeing, the mosaics (still visible) were amazing, and the layout of the houses (which had clay water pipes). Don't skimp on this add-on to the Ephesus visit- it's really cool to see the homes, including some of the restored/in tact tiles. 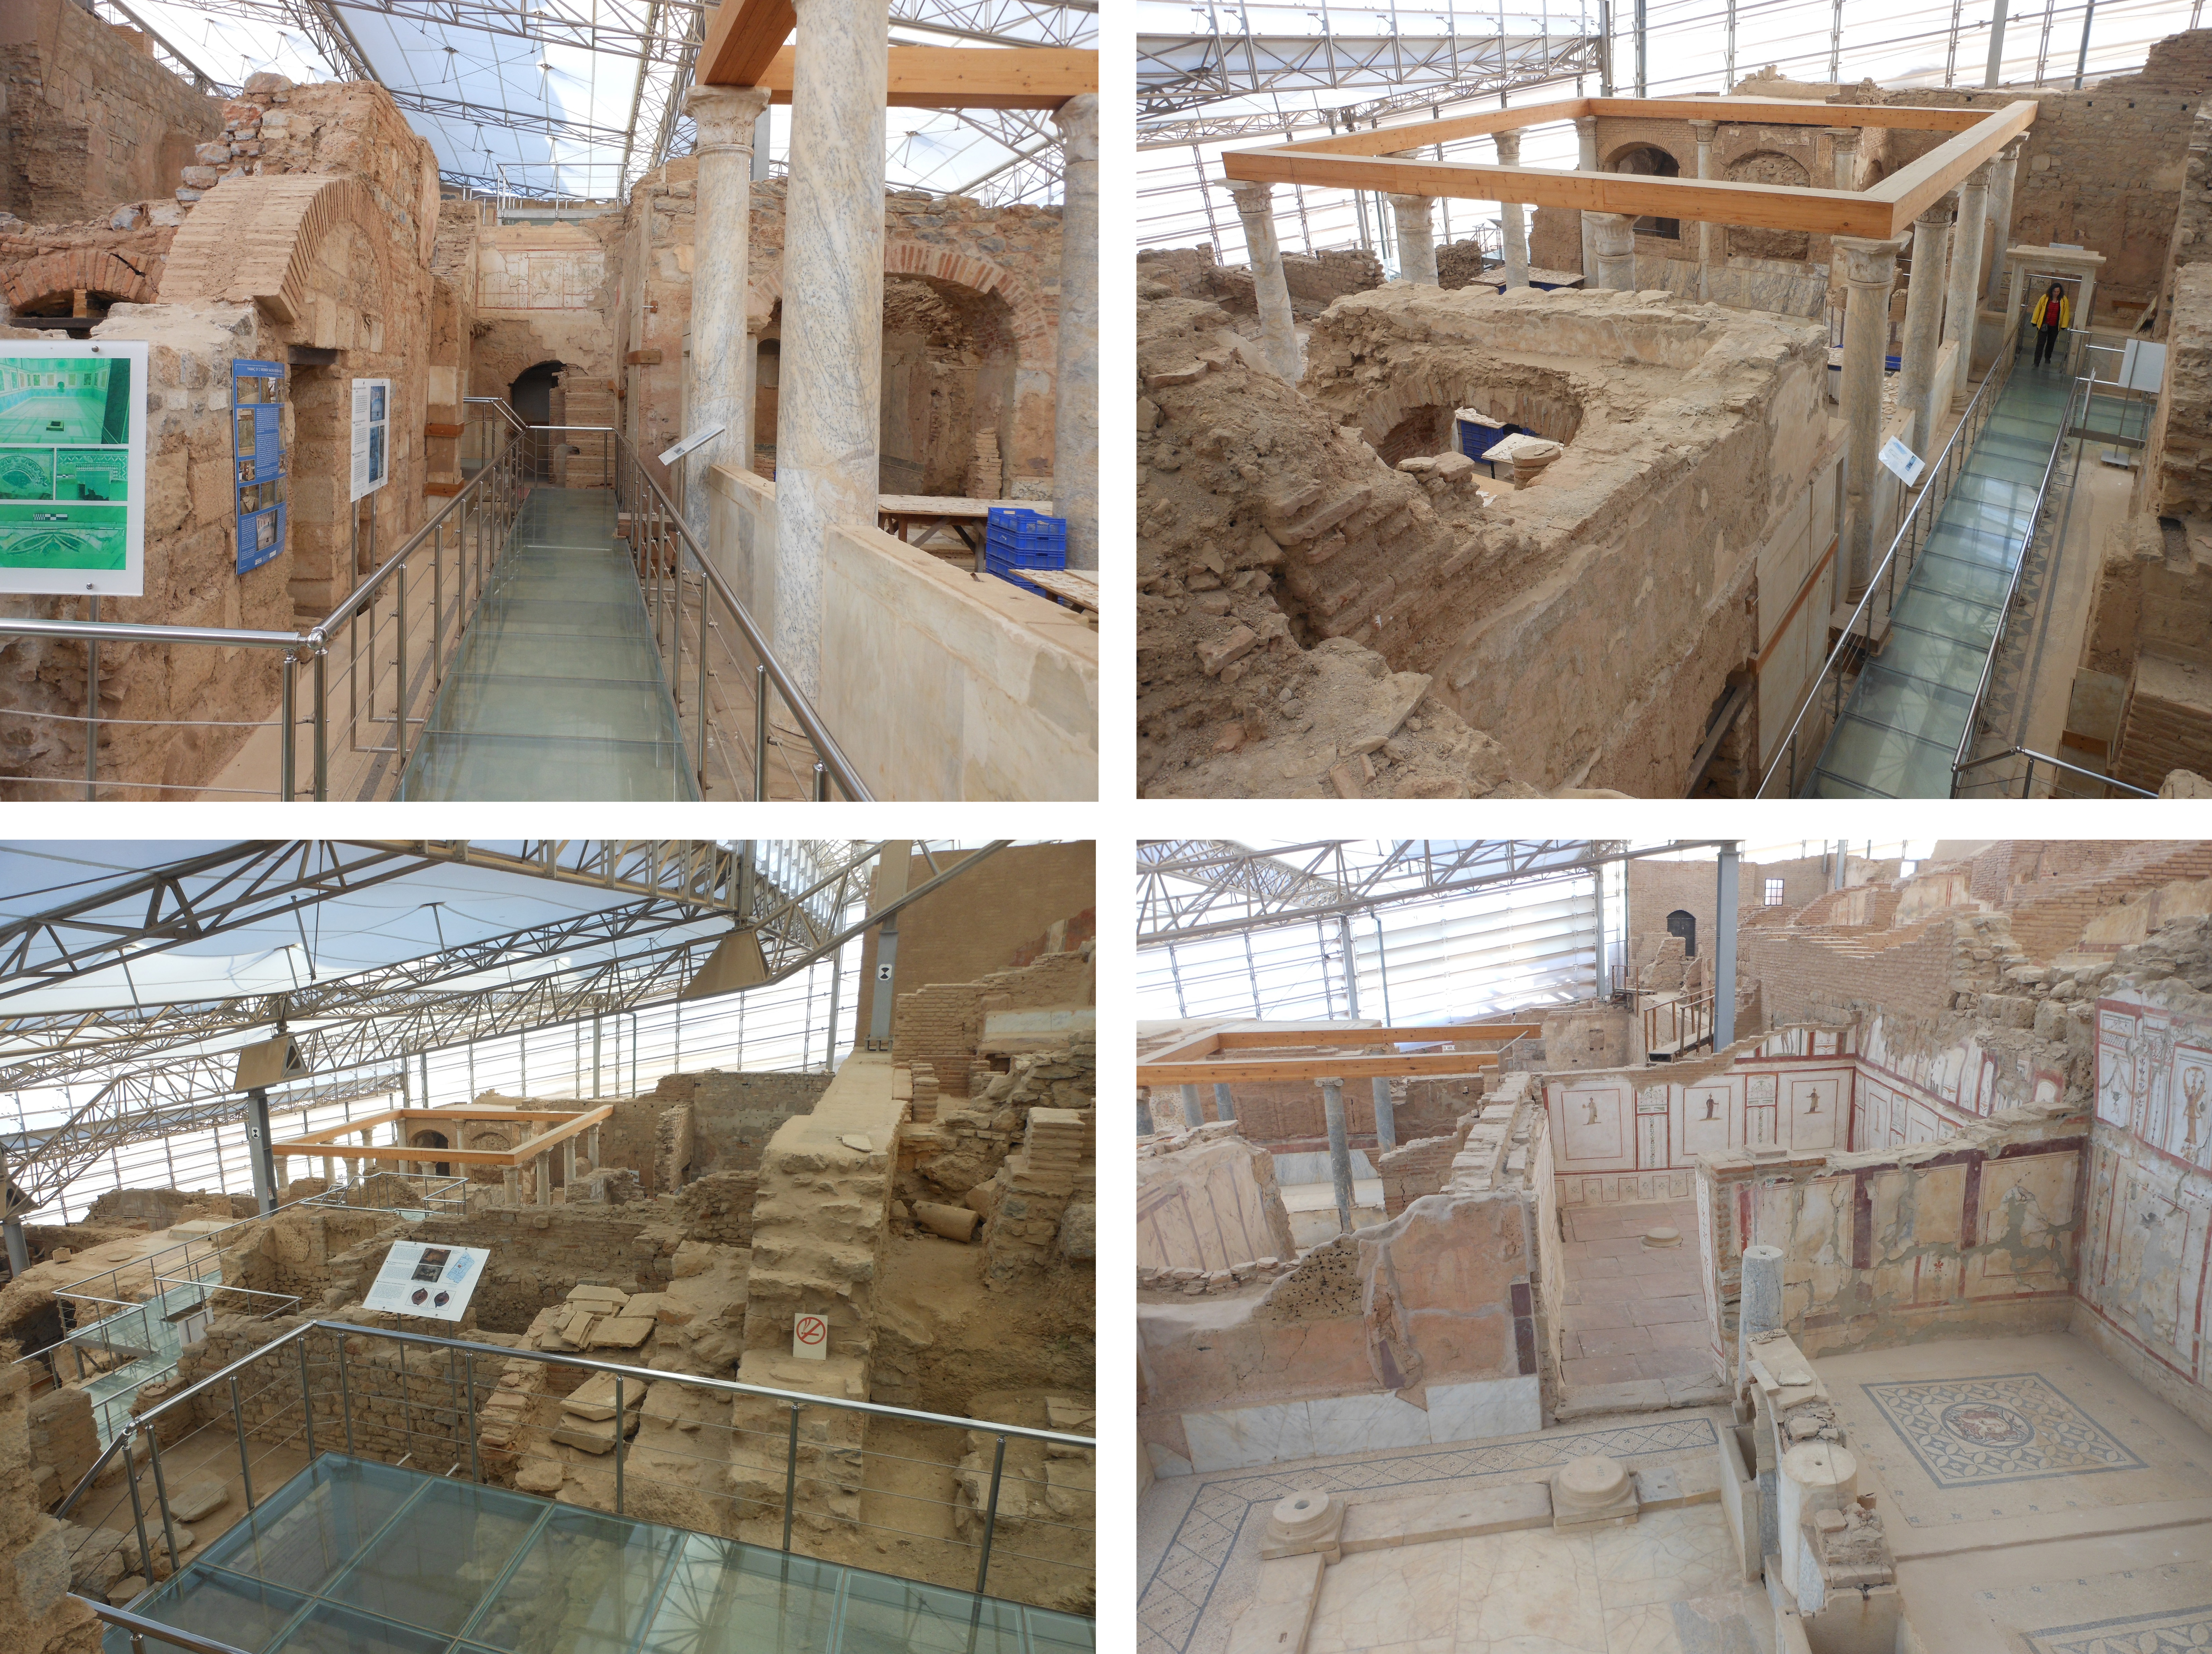 Don`t cheap out- if you are going to Ephesus see the Terrace houses- an active archaeologic site well worth seeing.! My family and I visited Ephesus for the second time in two years, and we had a wonderful experience… Our guide Remzy was knowledgeable, accommodating, and did everything in his power to insure that we had a thoroughly enjoyable trip. While this was our second time to Ephesus, we learned so much more by being with him and listening to his explanation of the history of the area. To add further to our delight, he took us to a local Turkish restaurant for a traditional lunch that was delicious and very inexpensive. Overall, I would have to rate our experience as very satisfied and think that any group would be fortunate to have this tour. Additionally, we were met by a new and comfortable van with lots of space and a driver who was excellent. Our guide was so informative and he was very funny making our experience so enjoyable! Awesome! Again, this is something that must be seen! Hard to imagine this type and size of city existed almost 2 thousand years ago. Many stairs and steps so be advised…. We spent a good amount of time at ancient ephesus and house of terraces and I can tell you, a private tour is the way to go. There were many group tours that would crowd around their guide to get a glimpse of what he/she was pointing out. With a private tour, you are able to set the pace with your guide and skip what you aren’t that interested in. We also visited the House of the St Mary, Temple of Artemis. It was a full day that did not disappoint and well worth the expense. Excellent. Pick up on time. Selcuk our guide, very knowledgeable. Fabulous lunch. Well done. Great private tour. It really made visiting ephesus easy.door to door service. I took the deluxe full day tour which was very informative. There’s a lot to see and I’m glad I had a full day and a great guide. The best part of Ephesus and not to be missed. Def·i·nite·ly Worth It! An amazing renovation, well worth a visit ! Found our guide outside the port (amongst a dozen others) with him holding a sign with our names. We had a very knowledgeable English speaking guide + a driver in a spacious air conditioned minivan. Very interesting archeological site. The Terrace Houses are part of Ephesus, the ancient ruins near Kusadasi, Turkey. Six 'townhouses' date from 1st century B.C. to 7th century A.D. The houses are covered by a giant metal (?) roof to protect the contents below. Catwalks allow you to walk just above the rooms and even through some rooms. After visiting the House of Mary, we drove to the historic ruins at the city of Ephesus. We saw all the things on our wish list, plus things we did even know about. We left the ruins and went to a carpet factory and saw firsthand how the carpets are hand tied. Then we had lunch, in a lovely garden setting, featuring traditional Turkish dishes, delicious a private tour is so much better and less expensive than any group tour the cruise ships offer. The team was absolutely fantastic.I definitely recommend this place to everyone! Thanks guys !! The Terrace houses within Ephesus are well worth the visit – work is still proceeding on the houses, as it is much of the site. This is a great tour. The car is new and clean, the guide well spoken and knowledgeable. Great private tour. Our guide Koksal was terrific and we were oicked up and dropped off at the port of Kusadasi. Definitely recommend. Though the economically-built cover makes the visit comfortable, it really distracts from the visual enjoyment of these beautifully-preserved ruins. One can imagine the life of well-off families living here in those times. Taking photos here is facilitated by the well-planned elevated walkways. Carrying a small digital camera makes it easier to take some photos one-handed in between the scaffolds. Restored by the Austrian and Turkish governments, these homes were for the top tier wealthy individuals that lived in Ephesus. They had running water, and sewer systems, very advanced for that era. hola a todos les quiero contar la experiencia que vivi en turquia tomamos un tour privado de dia completo en efeso primero nos recibieron en el aeropuerto de izmir con un coche van de lujo antes que nos subieramos el aire acondicionado estaba bien fresquito la van despues conocimos a nuestra guia ARZU que hablaba un castellano bastante fluido que me dejo sorprendida y luego comenzamos nuestro tour privado primero comenzamos por efeso la guia nos explico todo como debe ser nos explico la biblioteca el coliseo de efeso las tumbas, las casas terrazas agora y todo lo que esta dentro de efeso luego salimos camino a la casa de la virjen maria fue un camino bastante lindo ya que esta todo lleno de arboles y naturaleza cuando llegamos y vi la casa se me pusieron los pelos de gallina 🙂 fue una experiencia fascinante la verdad luego fuimos a almorzar y regresamos la verdad si tuviese la oportunidad de retornar no tengan la menor dduda que lo haria sin pensar un segundo gracias a todos que hicieron posible este tour privado de dia completo …. Highly recommend a visit to Terrace Houses in Ephesus ! The Terrace Houses, though not part of the regular tour, are well worth the cost to visit. The frescos and the tiled floors are great. impressive is that the plumbing from over 2500 years ago still works!!!! Best tour ever! So much to see and our guide was the absolute best very well spoken and she was an archeologist she really knew her facts. You will not regret this at all amazing houses, marble facades, frescoed walls and mosaics. The painted walls, tiled floors and many more details are there to see. You can actually walked through the excavation and recovered homes. A must see. These houses are an extra cost while walking through the ruins of Ephesus. The houses are so well preserved it is simply amazing. Murals, paintings and many other things are preserved in such a way the houses look very close to how they did over 2000 years ago. We were travelling on a cruise ship with 3 couples and booked a private tour. Our tour guide Yesim was great! She was very knowledgable and could answer any question we had. Even though it was very crowded in Ephesus, Yesim seemed to get us to each place before the big crowds arrived! We would definitely recommend this company and tour guide, and Turkey of course! They call it the worlds largest jigsaw puzzle, but little by little they are getting it done. What an amazing accomplishment! It gives great insight into the lives of the people of Ephesus. Take at least an hour just for the houses. House of Mary and Ephesus was more than we imagined great tour guide Sinan. fantastic day from start to finish lunch was excellent great memories. Really neat place. Some of the colors on the walls are stil present which was neat. It was also soooooo hot it was nice to get into the shade. This was a big place. It does have stairs as you climb up everything. Excavaition underway makes this a really neat place. This was well worth the money. Emrah was the bet tour guide. Very professional (he was in a suit) and so very nice and friendly. All in all this was the best tour we did. It is worth paying extra for the extra terrace. They have done a lot of work to recreate the Roman houses and you can omagine the people who would be living there. Be prepared to climb lots of stairs, however well worth it! To see their rooms with colourful wall paper similar to how we would decorate was mind blowing! When we visited Ephesus, we made sure to book a tour that included the Terrace Houses as we were told they were not to be missed. We were certainly not disappointed. The houses are beautifully preserved and have a igneous set up of see through platforms and stairs which allow you to see all aspects of the ruins. This was one of the best and most economical tours of our cruise and we certainly recommend that anyone visiting kusadasi consider this tour. Exceptional tour with Turkey and Ephesus Vision. Great and well informed guide with small group of 5. Delightful lunch at restaurant. Dropped back the port of kusadasi fabulous day. With an additional cost and quite a high one and that I was happy to give the Terrace Houses a miss. After all the highlight was no doubt the Celsus Library and nothing would beat that. Eventually, I decided I'd go in with my friend, rather than wait around in the searing heat. This is good value for money, we were picked up and dropped off to the port. Our mistake was only taking the half day tour. Ephesus only needs a minimum 4 hour. We chose a private guided tour rather than a ship excursion and would highly recommend the deluxe ephesus fullday tour. I enjoyed the Terrace Houses, and it is worth the extra money to see the dig in progress and the uncovered mosaics. If you are not overly interested in either of these, its a site you can miss and enjoy the incredible ruins of Ephesus around it. Note that there are an awful lot of stairs to climb ! Easily the most interesting ancient site I've ever seen. The extra cost is well worth the money. A super glimpse into ancient (upper class) living. I think a tour in Ephesus must include the terrace houses. They explain so much about daily living and the truly advanced accommodations available in those ancient days. Hot running water in the baths, beautiful paintings on the walls. There is still much to be excavated…very interesting. It was crowded and a lot of stairs, but worth it! This is a relatively new museum, and very well organized. For any folks who have been to Pompeii, or Herculaneum, or Ostia Antica outside of Rome expect similar delights at The Terrace Houses. If you are planning to visit Ephesus, do include this museum in your visit.The mosaics alone make the visit well worth it. todo magnifico fue impresionante el paseo por efeso y la casa de la virgen maria donde se dice que vivio sus ultimos dias es un lugar bastante espiritual me gusto les doy un diez por la gran lavor que hicieron con nosotros en tan poco tiempo consiguieron que vieramos mucho….. Very interesting and informative trip. The tour guide was very friendly, fun and knowledgeable in the history of ephesus. Highly recommend this! Obrigado por tudo o que nos foi oferecido como uma agência de viagens e obrigado por nos dar um bom guia…. If you are visiting Ancient Ephesus and get a chance to tour the Terrace Houses, do so. They are well worth a visit, as they are extremely well preserved, and give a good idea how the wealthier citizens lived. The houses are located inside Ancient Ephesus, but there is a separate admission charge. The van was comfortable, the driver was careful it was a wonderful experience. We have travelled a lot but we have never used a tour guide before so we were a little skeptical. We also had an offer from another tour operator and it was pretty much the same price. We had a fantastic day, It was amazing. lunch was great, ephesus was a great place to visit we had a wonderful day. Gunes was an excellent guide. We had a lovely day lunch was very good, and the group really enjoyed themselves. Highly recommended and I hope you get Gunes! Outstanding! this seemed like an expensive side trip but it was worth every cent. Highly Recommended. Worth the extra money as it shows the workers excavating and how advanced the culture was at the time. Ephesus is crowded at the best of times, but because there is an extra charge for the terraced houses, many people ignore them. As a result they can be peaceful and they are very beautiful. It is as though the people left the houses in the 1960's rather than 4th Century AD. We used this tour instead of booking a tour through the cruise company. We had a half day tour of the ruins of Ephesus and The Virgin Mary’s house. We were also taken to a carpet maker to see how carpets were made and lunch. The carpet demonstration was interesting however, I did feel uncomfortable not making a purchase. So beautiful! Pay the extra money and enjoy this amazing architecture and tile floors. Interesting to see the excavation work continue as well. The Terrace Houses are a must see for those of us who love to learn. The beauty of the architecture, design, and art, give us a glimpse into the lives of the people living in the thriving city of Ephesus, 2000 years ago. The excavations are amazing, and a favorite site for everyone in our party. Thank you very much for the most wonderful day. Excellent tour and yesim was a wonderful guide! Slope Houses in Ephesus is Absolutely A·Maz·Ing ! It was really neat to see how the wealthy lived centuries ago- with frescoes on their walls and mosaics on their floors. One house had its own chapel. Well worth seeing. Our day went perfectly, our guide was open and flexible to letting us tour at our own pace and we always seemed at least two steps ahead of the large tour groups.. Absolutely amazing tour tour guide selcuk was incredibly knowledgeable interesting, informative and personable. He made the day thoroughly enjoyable. We highly recommend this tour and thank you for such a wonderful way to see this impressive famous ephesus. This is must see while in Ephesus and its still being explored and excavated. INCREDIBLE!! If you are in Epheses you MUST add this to your tour. Absolutely breathtaking. Thank you very much for a lovely day. Our guide was extremely knowledgeable and courteous. The vehicle was impeccable. Trip was great. Our driver was very personable. Temple of Artemis, House of Virgin Mary and Basilica of St.John…It was really fantastic. Excellent ! Was an interesting experience. This is a separate fee from the city but well worth it and it's shaded so it's a nice relief from the heat. We opted to include the Terrace Houses in our visit to Ephesus and felt that it was very worthwhile. We did have a guide to explain everything , and I would highly recommend this – we often venture out on our own, but really feel that we wouldn't have enjoyed Ephesus (and Terrace Houses) nearly as much without a guide. Walking on the colorful Roman Mosaics of Terrace Houses the thing that i love as a history lover. I certainly suggest you to visit Terrace Houses! This is an extra cost but well worth it. This magnificent excavation just blew me away with how much was preserved. Also being under a sun roof it was a great break from the heat. We really felt that this tour was well worth the money, and would highly recommend Koksal as a guide. By far the best part of Ephesus. Ms. Arzu from aboutephesus.com was our guide and she gave us a thorough and interesting look into real life in the ancient past. our guide yesim efficiently guided us through the crowds making sure that our small group of 8 arrived before the larger buses thus allowing us to get the full experience. our lunch at the carpet school was both tasty and enlightening none of us actually understood the process of collecting silk or the painstaking job of making those beautiful works of art. We wish that we were there to purchase but not this time. The Terrace Houses are the ancient version of condos. Archealogists have found work reassembling the floor mosaics the tiles are laid out on huge tables like jigsaw puzzle pieces, and they have uncovered ancient wall murals reminiscent of soothing wallpaper. La visita a Efeso, è una tra le più straordinarie che si possa fare in Turchia. La sua splendida architettura era dedicata alla dea Artemide, il suo grande tempio, era considerato come una delle Sette Meraviglie del Mondo Antico. Efeso è di grande interesse per i cristiani dato che c’è la casa della Vergine Maria, si ritiene che la Vergine Maria venne a Efeso per sfuggire alla persecuzione cristiana e vivere gli ultimi giorni della sua vita. La casa dove si pensa abbia vissuto si trova in cima a una montagna e può essere visitata liberamente. Abbiamo ammirato il teatro , il ginnasio, i bagni, l’agorà e la biblioteca di Celso, che custodiva 12.000 rotoli nelle nicchie delle pareti. La biblioteca, recentemente restaurata, è stata costruita in onore di Celso Gaio. Ultima delle meraviglie che abbiamo visitato durante il nostro tour della Turchia, Efeso ci è particolarmente piaciuta, inoltre è uno dei più grandi e meglio conservati siti dell’antichità. Our visit to ephesus was great as well as educational made possible by our terrific tour guide personality as well as her mastery of the English language made the day a delightful one. We wish we could have her for all the tours we take!! I wasn't sure what to expect but this place was amazing! It's fascinating to see how homes were in ancient times and all the time and effort used in excavation but the sights it yields. I would reccomendation this! Even the kids we were with – 9-14 enjoyed it. We were there some 25 years ago. Terrace houses were not dug up then, it was amazing to see them on our last visit. NOSOTROS V?AJAMOS ESTE ANHO Y CREO QUE REC?EN ESTABA COMENZANDO LA TEMPODA TUR?ST?CA HAB?A MUCH?S?MA GENTE DE TODAS PARTES DEL MUNDO PERO SABEN QUE MAS ME LLAMOS LA ATENC?ON? FUE QUE HAY GU?AS EN TODOS LOS ?D?OMAS NOSOTROS CON M? FAM?L?A TOMAMOS EL TOUR DESDE EL CRUSERO QUE LLEGO A ?ZM?R COJ?MOS UN PR?VADO POR SOMOS UNA FAM?L?A NUMEROS PARA SER EXACTOS ERAMOS 8 Y LA VERDAD YA ME BASTA CON LOS OCHO Y NO QU?ER?AMOS V?AJAR CON CUARENTA MAS SOLO POR UN HECHO DE COMOD?DAD EN LA VAN QUE NOS D?ERON CAB?MOS TODOS S?N N?NGUN PROBLEMA YA QUE ERA BASTANTE ESPAC?OSA Y MUY COMODA CREO QUE ERA DE ESTE ANHO NO ME RECUERDO EL MODELO PERO LO UN?CO QUE SE ES QUE ERA DE BASTANTE LUJO NO ME ESPERABA UNA FURGONETA DE ESE EST?LO POR EL PREC?O QUE PAGOS ME ESPERABA ALGO MAS V?EJ?TO 🙂 PERO CUANDO LA V? ?NCLUSO LE PREGUNTE A “MURAT” QUE FUE NUESTRO GU?A A TODO ESTO QUE S? ESA VAN ERA PARA NOSOTROS Y EL SE RE?A Y ME DEC?A S? S? ES SOLO PARA USTEDES Y AH? ME D? CUENTA QUE EL TOUR PR?VADO ES LO MEJOR QUE PUDE HACER EN ESTE CRUSERO FAM?L?AR QUE NOS D?MOS EL CONDUCTOR QUE TEN?AMOS ERA BASTANTE AMABLE Y S?EMPRE CON UNA SONR?A MUY ATENTO MANEJABA BASTANTE CAUTELOZO ADEMAS SE PREOCUPABA QUE EL A?RE ACOND?C?ONADO ESTUV?ESE S?EMPRE EN LOS GRADOS ADECUADOS POR EJEMPLO LO ENCEND?A D?EZ O QU?NCE M?NUTOS ANTES DE QUE NOS SUB?ERAMOS AL LA VAN ESO ES AGRADABLE YA QUE EN VERANOS EFESO EL MAS CAL?ENTE QUE FUERA DE EL POR QUE EL MARMOL REFLEJA EL CALOR PERO COMO LES D?JE ALLA SE PREOCUPAN MUCHO DE EL A?RE Y ESO ME H?ZO SENT?R UN AL?V?O BASTANTE GRANDE CADA VEZ QUE SUB?A Y BAJABA DE LA VAN… EL GU?A QUE TUV?MOS OSEA “MURAT” ERA UNA PERSONA MUY AGRADABLE DE UNOS TRE?NTA Y POCO Y MUY CONOCEDOR DE LA H?STOR?A DE SU PA?S Y LO QUE TAMB?EN ME LLAMO MUCHO LA ATENC?ON FUE QUE EN TODAS PARTES QUE ENTRABAMOS LO REC?B?AN MUY B?EN AUNQUE NO LO CREAN ESO TAMB?EN DA UN RELAJO BASTANTE GRANDE POR QUE DA A COMPRENDER QUE LA AGENC?A NO TE DA CUALQU?ER GU?A SOLO POR QU?TARTE EL D?NERO EL SE MEREC?O TODO LO QUE LE TOCA DEL PREC?O DEL TOUR ADEMAS DE UNA PEQUENA PROP?NA QUE LE D?MO 🙂 POR SU BUEN TRABAJOS SE TOMO LA PASC?ENC?A DE CHARLAR CON LOS OCHO ?NTEGRANTES DE NUESTRA FAM?L?A Y ME GUSTO MUCHO… LO QUE V?MOS Y V?S?TAMOS NO T?ENE EXPL?CAC?ON LAS RU?NAS DE LA ANT?GUA C?UDAD DE EFESO FUERON ALGO DESLUMBRANTE NO ENT?ENDO COMO H?C?ERON COSAS TAN MARAV?LLOSAS S?N LA TECNOLOG?A DE HOY ERA TODO PERFECTO, LE LLAMAMOS RU?NAS PERO EN REAL?DAD YO CREO QUE HAY QUE LLAMARLA GRAN C?UDAD DE EFESO TODO PERO TODO ERA GEN?AL EL COL?SEO LOS PASAD?ZOS DE EL, LA B?BL?OTECA ERA G?GANTE Y LA POD?AMOS VER DE CUALQU?ER PARTE DE EFESO QUE ESTUV?ESEMOS ?MAG?NENSE LA ?NMENS?DAD Y GRANDESA DE ESA CONSTRUCC?ON LA CASAS TERRAZAS QUE HAY DENTRO DE EFESO SON MUY L?NDAS CUANDO NOSOTROS FU?MOS AUN ESTABAS EXCABANDO PARA SACAR MAS COSAS PARA LA V?S?TA DEL TUR?STA, LUEGO FU?MOS A LA CASA DE LA V?RGEN MAR?A LUEGO DE UNOS VE?NTE M?NUTOS EN COCHE PASAMOS POR BOSQUEZ Y NATURALEZA TODOS M?RABAMOS POR LAS VENTANAS DE LA VAN PARA VER LA CASA PERO NO LA VE?AMOS Y CUANDO DE PRONTO DENTRO DEL BOSQUE LLEGAMOS ERA COMO UN ENORME JARD?N Y UNA MODESTA CASA Y ESA ERA LA CASA DE LA V?RGEN MAR?A TUV?MOS LA SUERTE DE ENCONTRARNOS CON UNA M?SA AS? QUE DEC?D?MOS ?R A REZAR TAMB?EN LE EXPL?CAMOS LA C?TUAC?ON A “MURAT” Y NOS D?JO QUE N?NGUN PROBLEMA QUE EL NOS ESPERAR?A A LAS AFUERAS ME PAREC?O MUY NOBLE DE PARTE DE EL POR QUE ME GUSTO EL GESTO EL ES DE UNA REL?G?ON D?FERENTE PERO LO TOMO CON MUCHA MADUREZ. LUEGO DE LA CASA DE LA V?RGEN MAR?A CONOC?MOS EL TEMPLO DE ARTEM?SA LA VERDAD NO HAY MUCHO QUE VER PERO TAMB?EN ES MUY L?NDA ES PARTE DE EL TOUR POR ESO FU?MOS , EL ALMUERZO FUE LO MEJOR DESPUES DE UNA MANANA CANZADORA Y LLENA DE CAM?NATAS COM?MOS MUCH?S?MO LA COM?DA TURCA ES MUY BUENA ?NCLUSO DESPUES DEL ALMUERZO COMPRAMOS UN RECETAR?O TURCO PERO EN CASTELLANO PARA HACER ALGUNAS COSAS QUE COM?MOS ALLA, EN F?N EL TOUR FUE DE MARAV?LLA TODOS QUEDAMOS MUY SAT?SFECHOS CON LO QUE V?MOS Y LA ATENC?ON DE LA AGENC?A SEAN GU?AS CONDUCTORES O S?MPLEMENTE LA GENTE QUE NOS REC?B?O EN LOS LUGARES V?S?TADO FUERON LAS VACAC?ONES MAS HERMOSAS QUE V?V? EN M? V?DA Y NO CABE LA MENOR DUDA QUE A F?NES DE ESTE ANHO VOLVERE… QUEDA TODO RECOMENDADO Y SE LOS D?RE A TODAS LAS PERSONAS QUE VAYAN A EFESO… LES GRADECEMOS DE TODO CORAZON LO QUE H?C?ERON POR NOSOTROS…. I was amazed at the precision and focus needed to put together these houses. So hard to beleive. i will warn you that there alot of stairs to climb to view the entire exhibit, however our personal guide from ephesustoursguide.com arranged with the manangement for us to only tour half so my Mom wouldnt have to climb so many. The van was very nice and huge for passengers.